Share the post "Details About Uterine Fibroid Embolization"
Wondering whether there is pain during the procedure? Or whether you will have to be “put to sleep”? Is the procedure painful and will I have to be put to sleep? The procedure itself is not painful. However, most women experience moderate to severe pain and cramping during the first 6-12 hours after the procedure. This pain is typically controlled with intravenous narcotics, but an epidural may be used, which may numb the pelvic area for several hours. Also, a general anesthesia is not used. Patients are sedated but conscious during the procedure. A local anesthetic is used to numb the site where the physician inserts the catheter. UFE is not painful, and many patients don’t remember anything about the procedure due to the effects of the “twilight” sedation. Immediately following the embolization procedure the catheter is removed and pressure is applied to the entry site for about 15 minutes to stop any bleeding. Almost all patients experience crampy abdominal pain following the procedure. At times, patients are admitted to the hospital overnight and can usually be discharged home the morning following the procedure. Most patients can return to work within a few days. 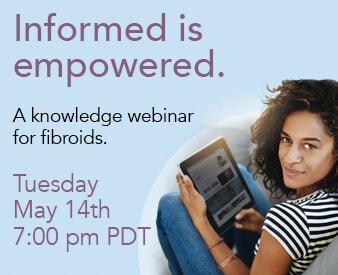 Have a comment or question about this post or about fibroids? Scroll down to post a comment to this blog or Click here to ask your question.